Lewis Hamilton (1st): "I'm very happy with the pole lap. I didn't quite put the second lap together so I was hoping the first one would be good enough and luckily it was! I love these kind of conditions - it makes it more of a lottery. I nearly didn't make it through Q2 when I got caught up with the Ferrari and the Sauber. It's so easy to get caught out and that makes it even more exciting. I'm looking forward to tomorrow. The car feels great and the heat always makes this race into a challenge with the strategy. The temperatures make it hard on the tyres and last year we made three stops, so it's tough on the cars as well as the drivers. We'll also be starting earlier in the day compared to qualifying today so, providing it stays dry, it will be a very hot race. It's not the easiest place to overtake so the start will be crucial - especially with the long run down to Turn One. Ferrari have made some big improvements and it's great to be lining up alongside a four time World Champion, so it should be an interesting race." 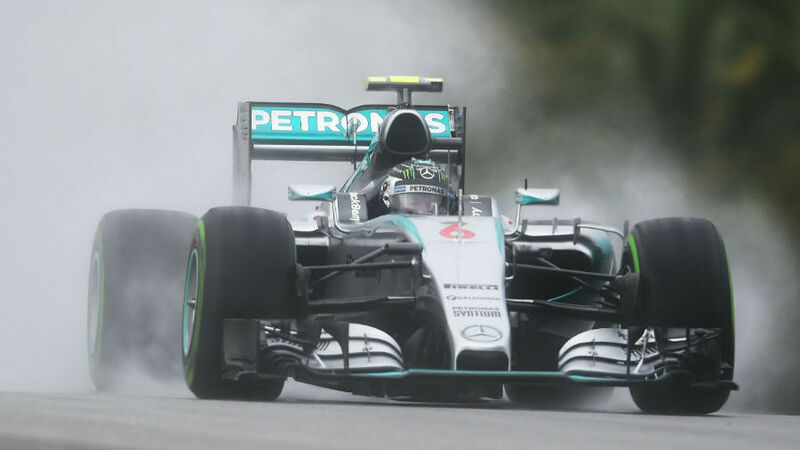 Nico Rosberg (3rd): "Two other guys just did a better job, so it was a bit annoying for me today. 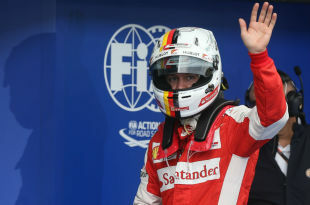 Lewis did well and especially Sebastian, who was surprising in the Ferrari, so hats off for him. But I think I have a good chance tomorrow at the start as I will be on the clean side of the grid. I will try to attack Seb off the line and then there are some good opportunities also to catch Lewis. This race will be very demanding on the tyres so we will maybe see three pit stops and there is always a chance of taking a different strategy. So I very much look forward to the race. I will push hard." Toto Wolff, executive director (business): "After a smooth Q1, it proved pretty difficult to get the lap right in Q2 and Q3 because of the conditions. In Q3, we did a one-lap run with both drivers, then planned to do the time on the second lap of the final run when the track would have been driest. But in hindsight, the tyres were past their best and we were lucky that Lewis's time from the first run was enough to get pole. 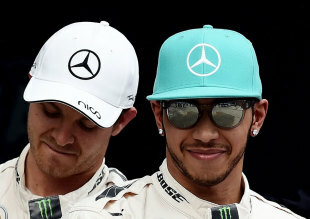 So in the circumstances, to get P1 for Lewis and P3 for Nico is a good result. But as always, you get no points on Saturday. We need to make the most out of these starting positions in what will be a long and demanding race." Paddy Lowe: "Wet qualifying sessions are always very difficult to manage. You can easily make big mistakes that cost you badly. We ran a good strategy at the various stages of qualifying but surprisingly the track did not improve through Q3. Lewis got his pole position in the first run and while Nico did improve, neither got the best out of their car in that second run. I think we could have claimed the first row with a slightly different plan but we are really happy that we have two cars in good positions to compete for a strong race result tomorrow." Daniel Ricciardo (4th): "We've always gone pretty well in the wet and there are still some things we can improve, but fourth is a good result for the team. The second row is a good starting position and we should hopefully have some battles tomorrow. We're behind Mercedes and Ferrari, but we are ahead of the Williams and the conditions were tricky, so that's good, step by step we are improving and heading in the right direction. Tyre degradation will be high, so it will probably be a three-stop race tomorrow. If we can finish in the top four, that will be good. Daniil Kvyat (5th): "It was a decent qualifying for us, P4 and P5 is good for the team but I think on our lap we maybe went out a little early, it might have been better later on but it's hard always to know with the conditions. Overall, there are a lot of positives to take from this weekend and we are seeing some improvements, it's a good start." 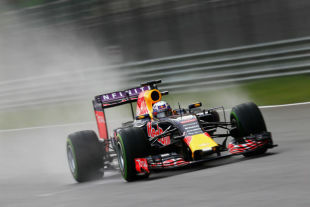 Christian Horner: "Both the team and drivers got the most out of difficult qualifying sessions today. After the rain arrived in Q2, it was always going to make life tricky and, as we saw, in Malaysia the track dries incredibly quickly; both guys got the maximum out of the car to line up fourth and fifth. Hopefully with strong grid positions we can have a good race tomorrow." Valtteri Bottas (9th): "I am a little disappointed with how the day turned out. I felt like I did a good lap so was a little surprised to be in P9. I wanted to be the last car across the line and so was pleased to be, we just have some work to do on the wet weather performance. Hopefully it will be dry tomorrow, but it will also be hot and so nothing will be easy, especially from ninth." Felipe Massa (7th): "It wasn't the easiest day today, I think in the dry we can both be in the top five. We still have some of the issues in the wet that we had last season, hopefully we can now look to solve a few of those. Tomorrow looks like it will be dry though, so we hope for a better race." Rob Smedley, head of performance engineering: "Changeable conditions made it a tough session. We were on the right tyre at the right time and attempted to be the last car across the line knowing the track was improving every lap. We need to consider why our performance wasn't there in the wet conditions but we have a very good car in race trim as we saw on Friday. We have a lot to do tomorrow but the temperature is looking like it will be very hot during the race so we must make the right strategic decisions." 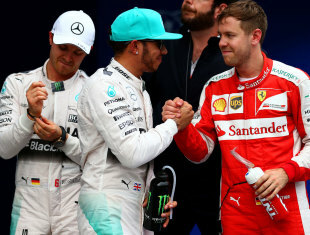 Sebastian Vettel (2nd): "I think we had a good pace in the end, it was very tight with Lewis. If you look back to one year ago, we had the same conditions, intermediates in the end and it was one tenth, so maybe next year ... For sure the result puts us in a good position for tomorrow. I think the target for Sunday is to extract the best race we can, and then we go from there. The nature of the track suits our car well, I expect nothing else than to be very strong tomorrow, but you never know about the conditions in Sepang. There is rain in the air that can hit you at the right time, but also make go all wrong, you just never know. Let's keep our feet on the ground, in the end we have to look after ourselves. Mercedes is very strong and has an advantage, but it would be nice to give them a hard time tomorrow, it has been a bit too chilled for them in the last months." 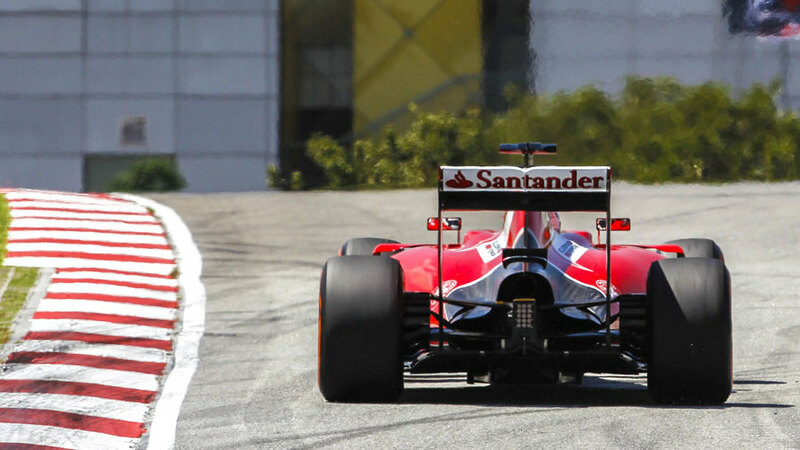 Kimi Raikkonen (11th): "Today it was simply a bad time to go out, we should have been out earlier. I did try to pass Ericsson but he was there trying to do his job; it's not an unlucky situation but it was a mistake. Tomorrow we'll try to climb some positions, for sure we have the speed but we are quite far from the front and when you start in this position is not going to be an easy race. Obviously there is going to be more risk in the first corner, but we'll try to make the best out of it tomorrow." Maurizio Arrivabene, team principal: "Today's result leaves a bittersweet taste. Seb has been just great and the same goes for the all team. About Kimi, I don't believe either in bad or good luck. First impression comments may render different opinions, but now we have to leave this behind us and focus on tomorrow's race. I'm sure that also Kimi, who is a great driver himself, will have a go." Fernando Alonso (18th): "Our form today wasn't unexpected, but I think our performance so far this weekend has maybe been better than I'd have anticipated before arriving here in Malaysia. In fact, I'd say the progress we've made since Australia has been fantastic - we're much closer to the cars in front now - but we're still under-performing and we still need to improve. However, the steps we're taking with the car show a lot of progress, so I'm optimistic that I won't be qualifying in Q1 for that much longer. "If it rains tomorrow, it'll be another learning process for the team. For me, too, the start procedure, the formation lap, the pit-stops - they'll all be firsts for me as I wasn't able to practise any of them in Australia. That makes me feel confident that there's a lot more to come in the next few weeks. This isn't an ideal position from which to start the race, but I'm fully aware that McLaren-Honda is a long-term project: we want to beat Mercedes, and to do that you need time, and to be prepared to take your chances as they come." Jenson Button (17th): "It was very difficult to get temperature into the tyres during the qualifying session - I really struggled in the first sector on every run I did, but was able to make the car work in the second and third sectors. Before qualifying, I think we'd have hoped to be a bit closer to the cars in front of us, but this weekend has seen us take a massive step forward in performance. "Also, I think our race pace - and our consistency over a long run - look like giving us a little extra. I'd like to think we could get closer to some of the cars in front tomorrow; that'll be something to look forward to. There are a lot of positives to take from this weekend: we've made a big step forwards in terms of pace. There's more to come from the engine and the aero package, but we know what to do." Eric Boullier, racing director: "Obviously, qualifying 17th and 18th isn't what we want to be doing - very far from it - but I don't wish to dwell on the self-evident negatives when in actual fact there are quite a few positives for me to comment on. First of all, it's good to see Fernando back in the cockpit, and even better to note that he approached and conducted his first McLaren-Honda qualifying session with such infectious enthusiasm. "Jenson and he recorded almost identical lap-times - a testimony to the fact that they both managed to get the absolute maximum from what MP4-30 currently has to offer. Although we're no farther up the grid here than we were in Melbourne, it's clear that MP4-30 has a significant amount more to offer on the swooping curves of Sepang than it did on the point-and-squirt switchback that is Albert Park. And that performance delta is a result of the fact that it's already a better car, not a result of the fact that we're racing on a very different kind of circuit this weekend. We're not satisfied; of course we aren't; we know we still have a mountain to climb. But it's clear that real progress is being made, and, bearing in mind where we are on our car-development curve at the moment, that's what matters. "That progress will continue, mark my words." Yasuhisa Arai, Honda chief officer of motorsport: "Within the space of just two weeks, we've worked incredibly hard to make some useful performance steps. And, as I said yesterday, it's encouraging to see that the gap to the front has been reduced, albeit not by enough to be competitive. Today's qualifying result was also a little bit disappointing. However, I think we can look forward to some enjoyable battles with those cars who qualified slightly ahead of us tomorrow. 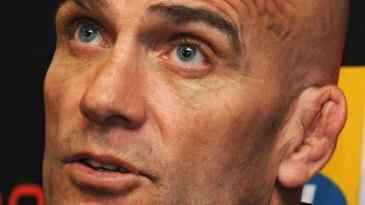 "This evening, we'll analyse everything that we possibly can from today, and see what comes from tomorrow." 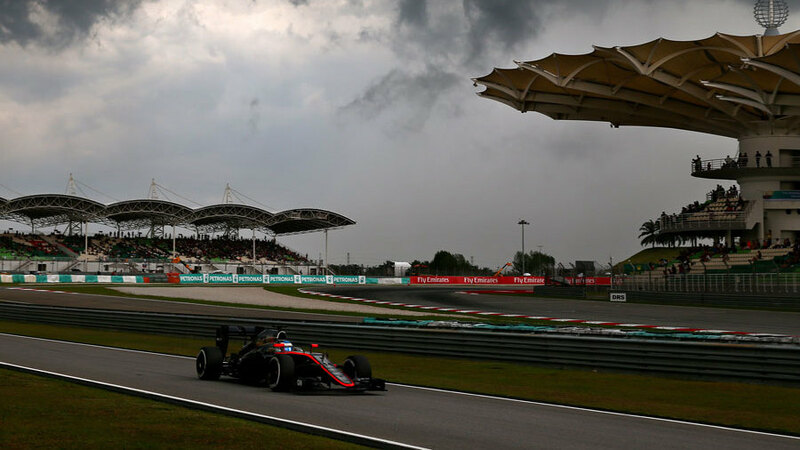 Nico Hulkenberg (13th): "It was a short qualifying session in the end with the rain arriving quite early in Q2. Maybe it would have been better for us if the rain had arrived five minutes earlier and Q2 was completely wet because everybody was able to complete a lap on slicks when the track was quite dry. It was only on the in-lap that the skies really opened. As it happens I think it would have been very difficult to reach Q3 anyway. The race tomorrow will be tough, especially managing the tyres in the high temperatures. There is always the chance of more rain and that's when you have to adapt quickly because it's all about being on the right tyre at the right moment. Whatever happens we will try our best to come away with some points." Sergio Perez (14th): "It was a short qualifying session in the end with the rain arriving quite early in Q2. Maybe it would have been better for us if the rain had arrived five minutes earlier and Q2 was completely wet because everybody was able to complete a lap on slicks when the track was quite dry. It was only on the in-lap that the skies really opened. As it happens I think it would have been very difficult to reach Q3 anyway. The race tomorrow will be tough, especially managing the tyres in the high temperatures. There is always the chance of more rain and that's when you have to adapt quickly because it's all about being on the right tyre at the right moment. Whatever happens we will try our best to come away with some points." Bob Fernley, deputy team principal: "It is always very challenging when you effectively have just one lap to get your qualifying time: this was the case today, and we feel both Sergio and Nico managed to extract everything that was possible in those conditions. Avoiding the pitfalls of Q1 was a positive result and P13 and P14 is about where we stand in terms of one-lap pace at the moment. We remain positive about our chance to score points tomorrow: the midfield remains very close and, if we can deliver the race pace we showed on Friday, it should make for an interesting Sunday afternoon. Of course, the weather conditions could play a huge part in the race; it will be crucial to make the right calls from the pit wall and make the most of any opportunity." Carlos Sainz (15th): "I'm disappointed with today's result, as getting into Q3 was more than possible and we could've ended up with a great result. We were looking very good, very sharp, but unfortunately I made a rookie mistake at Turn 14 and I locked-up when it was starting to rain, losing all chances to get through to Q3. If this rain hadn't arrived, we would've surely been up there. But these things can happen, we need to stay positive and learn from mistakes. I look forward to making up some positions in the race tomorrow as we know that we can fight for a good result." 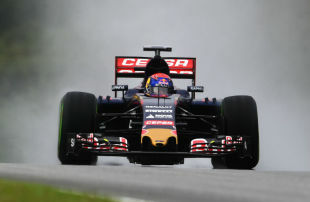 Max Verstappen (6th): "I'm very happy, it was a good session this afternoon, especially Q3. In Q1 and Q2 I wasn't totally comfortable with the car, but we had a good end of Q2. I was smiling when it started to rain, because that's what I like. I'm Dutch so I'm used to driving in the wet, even though here it's a completely different story. P6 is a really a good position to start tomorrow's race. I'm really looking forward to it and even if we seem to struggle a bit in the longer runs, I'm not worried and hopefully we can score some points." James Key, technical director: "Today's qualifying was a tricky session because of the weather conditions. We knew the rain was coming but we didn't know exactly when! I think Q1 was fine and I have to say that Carlos was flying in the dry conditions, he was really good and looked promising for Q3. Unfortunately that first lap on the Option tyres in Q2 was extremely unpredictable. We have to remember that our guys had never driven here in the wet before while all the people around them had, so they had to judge it as best as they could. Both drivers did a great job, but Carlos just missed it in Turn 14 and if not, he would've got through just fine together with Max. It's a real shame, because he had looked strong all day. Max did an outstanding job considering that we've never faced these conditions with him in the past and he nailed it. To be starting from the third row here is excellent! For tomorrow we have to watch the weather forecast again, so we will be keenly watching the radars and getting ready for all eventualities that can catch you out. Fingers crossed we can put together a good result for both drivers. We know the potential is there for that to happen." Romain Grosjean (8th): "We had never driven with wets on the car before so it was a bit of a discovery mission but everything was good. It wasn't an easy qualy, but the team made the right calls. It was a safe choice to go out on extremes wets first. We then went onto inters but the timing didn't allow us to finish our lap so we had to pit. We only did one timed lap in those conditions but we made it and I think we got the best we could.The race is going to be interesting; we have quite a mix of cars around us but it's a long race, it's a hot race and even without rain, it's quite a demanding race on the cars and on drivers. It'll definitely be interesting!." Pastor Maldonado (12th): "Racing is like this. It was quite busy start, going into a narrow corner. I just felt a big hit on the back and didn't see what happened. It's disappointing because it was a great chance for us to have a great race. The pace of the car was looking much better than in qualifying, so looking forward we can learn from this race. It was a good weekend until today, it's looking quite promising. In two weeks we will be again fighting for points and again doing our best to be even more competitive." Marcus Ericsson (8th): "It has been a great weekend so far. I was able to finish every session in a top ten position, and we can be satisfied to have repeated that in Qualifying. In dry as well as wet conditions I felt comfortable in the car. At the end of Q3 we were quite close to our competitors, which is positive. It was another good day for us, so we can be happy with today's result. Tomorrow we have a promising chance to again score points." Felipe Nasr (16th): "After the third free practice session we saw that we were still struggling with the rear tyres. In qualifying we seemed to have found something. However, on my second run on the medium tyres the rear wheels locked in Turn 4, and I lost time there. It has not been an easy weekend for me. We need to review what happened and learn for tomorrow. I'm already looking forward to the race. We know our car is competitive in race conditions, so I am confident about making up some positions." Monisha Kaltenborn, team principal: "This is a qualifying result which has showed again our potential, but mainly with one car. For Marcus it was an excellent personal performance. With this starting position we surely have good chances of scoring points, and we will do our best to achieve that. During the whole weekend Felipe had issues with the balance of the car, but was able to make a good step forward in qualifying. Therefore it is a pity he could not make it into Q2. Now it is important that we all focus together with Felipe on the race tomorrow, as the chances are there." Will Stevens: "Obviously I was very disappointed not to take part in qualifying. In FP3 we had a fuel system problem and we were trying to resolve that, but sadly we weren't able to get on top of it in time for me to take part. Looking at the positives, as we always try to do, the practice sessions showed promise and my times were within the 107% throughout Friday. Step by step we'll get there." Roberto Merhi (19th): "We were hoping to make the 107% time today, and that is what we have been pushing for through the weekend. Unfortunately we missed out by 0.4s in the end. In the three sessions Will has shown that the car is thereabouts on pace, while I had a spin in FP3 today so, along with yesterday, I have not been able to achieve the consistent running I wanted to for the team. Coming into this, our first weekend on track, we were aware that we have a lot of hard work to do and that this is just the start. So although we are disappointed for the qualifying result, we have to keep focus on what we have achieved to be here and to be able to begin our development." John Booth, team principal: "We knew our first weekend of running would not be without its challenges and although we had a positive day yesterday, it has been important to keep our expectations for qualifying in check. Our two drivers have done a solid job in their debut and Friday's practice showed promise in terms of having the pace for the 107% time, but today underlined that we have a lot of work to do." Paul Hembery: "As is often the case, we had an eventful qualifying in Malaysia that was interrupted by rain. The whole weekend is of course a big challenge, with hot temperatures pushing the medium compound in particular, and some proper wet running for the first time all year. The intermediate tyre was used for a handful of laps during pre-season testing, but we've obviously seen nothing like this quantity of water so far this year, and it was the very first time that the 2015 full wet tyres were run. The intermediate tyre performed particularly well, with an exciting end to the session. This year's race is set to be quite different to last year's as the race start is one hour earlier, which should lead to higher track temperatures than we have seen before. Because of that, a three-stop strategy looks set to be the best option, with a wide variety of possibilities."